You know that sense of well-being after you’ve finished a good book, when life is all contentment, and you feel a flush of joy? I read a very ‘Cecelia’ book, and I felt… pleased with everything and everyone. I couldn’t contemplate my next read for days – I had to let the euphoria of a tailor-made story buoy me up for some time afterwards. What was the book that ensorcelled me so completely? Only Sylvia Izzo Hunter’s debut fantasy novel, The Midnight Queen. Graham Marshall (Gray to friends and family) is a young postgraduate at Merlin College, in Oxford. His vocation is the study of magic, and he hopes to one day teach fellow magician-scholars like himself. All his plans are upset when he discovers a sinister plot against the head of his college after a night escapade gone terribly wrong. When his tutor, Professor Callendar, takes him off to his country estate, Gray wonders if anything will turn right again… but that is before he meets the Professor’s least-loved daughter Sophie. Sophie doesn’t have any magic, but that doesn’t keep her from being intensely interested in it, despite the fact that her mother died in a magical accident. Together, Sophie and Gray may solve several mysteries, and perhaps find something more as well. A good reading experience is as much luck as it is planning. 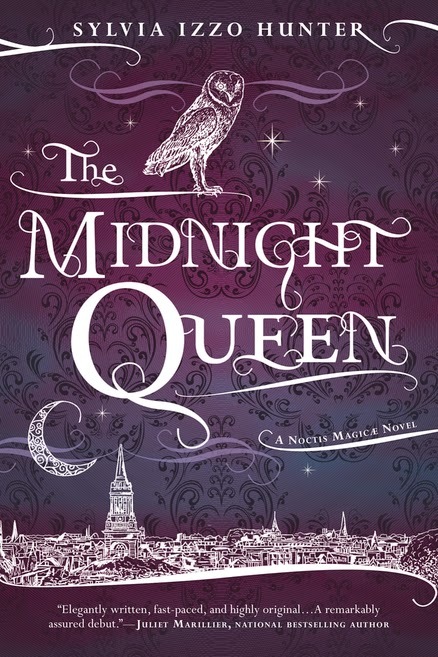 I knew from the description of The Midnight Queen that I had quite a good change of liking the book – after all, it was languages/scholars/magic/Regency-esque manners and mores… exactly what I ordered up on my wishlist for reading material earlier this year. So, I said I’d read it. I was also lucky in that I read it on a leisurely Sunday afternoon with time enough to get invested (and eventually, lost) in the story, too. This one starts at a modest pace, but it gathers steam as the story unfolds, and I’m not sure I would have treated it with so much patience if I hadn’t picked it up at the right time. Long story short, that’s how I came to be happily engaged in an entertaining book for a lovely Sunday afternoon. And why I am now going to bully you into reading it too (not actual bullying of course… more like, strong recommend-ing!). After the opening chapters, the narrative switches often between Gray and Sophie’s POVs, though Gray sees more ‘stage time.’ Gray himself is a studious, stubborn young man who happens to be in the wrong place at the wrong time to start the story. Overall he’s a smart, refreshing change from the ‘alpha male who thinks he knows everything’ sort of hero you sometimes see in fantasy. Sophie, though – Sophie is the winning character, if you can single one out. She’s young (only seventeen – YA crossover potential! ), thirsty for knowledge, curious, caring, and has been cloistered away by her father for much of her life. Though they’re both odd in their own ways, they make a good team, and much of their character development is spent learning how to complement each other and then putting that into practice. It’s a mutual appreciation society, though it takes some time for them to realize how much they mean to each other. I did get my allotment of swoon, though, never fear! But enough about the characters! I would say, though I loved Sophie, that most of the book’s charm lies in its complex setting and plot (once it gets going). Hunter has made up some languages and pulled in other (dead) ones, re-drawn national lines, and in all created an alternate world where everything seems familiar, but has been tweaked just enough to create a truly fantastical background. I want to go to Merlin and study it all myself! That said, there are also: secretive compatriots, plots upon plots, disguises and traveling incognito, true love, and parallels to Jane Austen’s novels. I also adored the sisterly (and sibling) relationships and friendships throughout the book. We all know in real life nothing gets done without a network of friends to help you out, but it’s rare to see the fictional equivalent in sci-fi and fantasy. I really loved that aspect, and I think it will only make the following books better (there must be more!). Before I run away with this review and tell you everything, I must mention the book’s cons. The only serious one is that the book started slowly. It takes a bit of dedication to stick with the narrative when you have sunburned gardening going on for pages and pages. That said, once it does get going, it’s gold. My other (minor) complaints all have to do with wanting more detail, more backstory, and more of the side characters. But that’s the beauty of creating such a rich world – I’m sure Hunter will come back and fill in bits I didn’t even know I needed. And I didn’t feel as if I was missing anything on that score, merely that I am now curious about everyone and everything. Recommended for: those who like books with magical adventure, romance and intrigue, fans of alternate world historical fantasy, and readers who liked Kate Elliott’s Spiritwalker series and Patricia C. Wrede’s Mairelon books. The Midnight Queen will be released by Ace (Penguin) on September 2, 2014. Fine print: I received an e-ARC of this book from the publisher for review consideration. I did not receive any compensation for this post. Well, this went straight onto my library list. It sounds amazing! Normally I'm not sure I would be ready for a regencyesque fantasy book, but your enthusiasm is catching. I think I'll check it out the next time I'm at the store. Yep, sounds like my kind of book too! The warning about it starting slowly is a good one. Thanks! I've been unsure about this one, but you've definitely tipped me over into giving it a chance!